My nephews and nieces love to manipulate anything that creates sound. It could be a guitar, drums or keyboard; they just love to explore these musical instruments. When I was in college, I have a keyboard. It was from my father and even though I don't play with it, I keep it for years until my brother asked if my nephews can keep it. I just gave it to them. 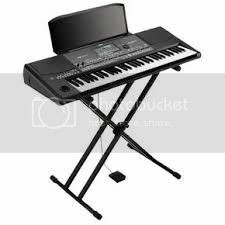 When I was shopping at the mall about a week ago, I saw a nice keyboard on display in a music store. I was tempted to buy it and give it to my brother for his musically inclined children. I was torn between buying a korg keyboards from musicians friend or the one on display. I would probably ask my brother's opinion first. I am sure my nephews would be delighted to have it. After all, they already made a piano recital before so; having the new keyboard would be exciting. It could flare up their music enthusiasm even more.